Objects stuck between teeth is a common occurrence to most individuals. It is caused by food fragments sticking in between the teeth during chewing. Hard foods such as popcorn hulls, fruit peels, seeds and meat fibers are prone to sticking between the teeth causing an irritating feeling. People with bad habits of chewing objects such as fingernails, pencils, and pens also stand a decent chance to have some fragments of the objects stick in between their teeth find themselves in a who need a Los Angeles emergency dentist have the following options. 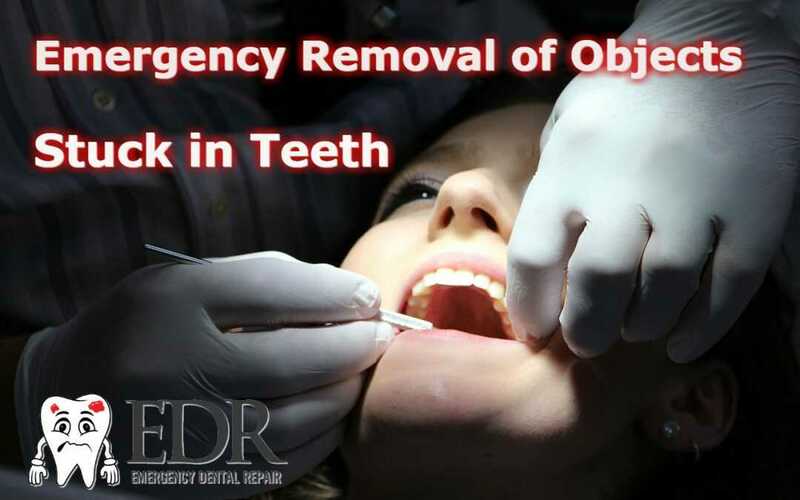 Once a foreign object sticks in between the teeth, the removal can be performed by the individual or an emergency dentist depending on one’s skills and the resources available. a) Rinse your mouth with warm water- This method applies to weakly stuck objects which are easily dislodged from the teeth. b) Brush your teeth- Using a toothbrush and toothpaste to gently rub against the teeth emphasizing on the affected area could be useful. One should however not try piercing the stuck object using the toothbrush spikes as this could be a risk to damaging the gum. c) Use a wax coated dental floss- Here, warm water is necessary to loosen the object and soothe the gums in case they have been inflamed. Using the dental floss, tie a knot in it then work back and forth on the affected area slowly loosening it and hopefully come free in the end. One can also improvise a string by following the same procedure though it is not highly encouraged due to hygiene. People with braces can still use this method but should make sure they rub very gently to avoid interfering with the braces. If all the above steps do not seem to work out, one should see a dentist. A dentist should be involved if one starts experiencing pain since this is majorly due to damage on the gum. People who frequently get objects stuck in their teeth are also advised to see a dentist. However, one should use a painkiller to counter the pain before seeing a dentist. a) Brush twice a day using a fluoride toothpaste. a) Use waxed dental floss after every meal to gently remove any stuck food fragments. Flossing should be done regularly and effectively to make the teeth used to the practice since in most cases people experience bleeding gums during the initial stages of using it. b) Avoid using sharp objects to remove stuck objects as it may lead to damage on the gum or even introduce bacterial infection. 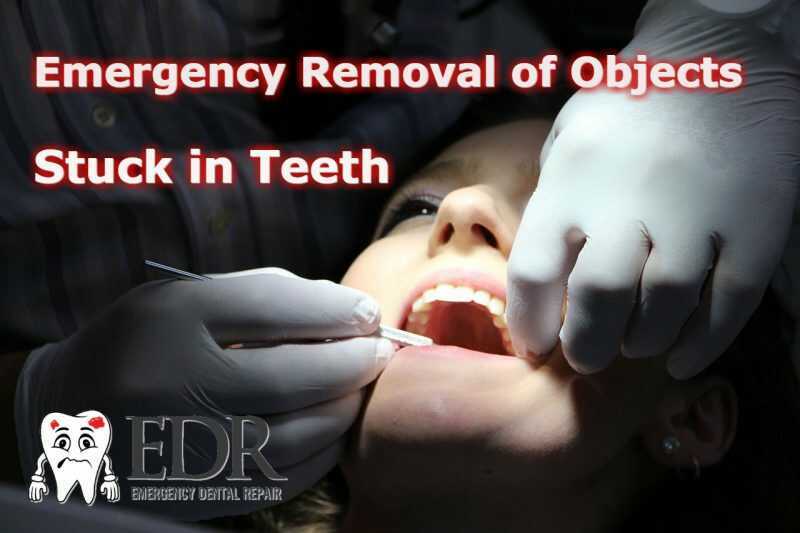 The above measures are necessary for both protection and emergency options for removal of objects stuck in between teeth. Remember that if you have any issues to contact an emergency dentist near you!